Whoever said TV was bad for you obviously didn't watch the shows that I watch. Watching The Rachel Zoe Project and Unique Sweets is not bad for me...on the contrary, it's quite inspiring! (I'm such a good excuse maker) No really, all kidding aside...every time I watch either of those shows I come away feeling like a.) i would kill to have Rachel Zoe's job or b.) i would kill to own my own world renowned bakery. okay, okay...maybe killing is a wee bit extreme, but that's not important. What is important is that on one episode of Unique Sweets they showed a bakery that sold all kinds of sponge roll/ jelly roll cakes. Growing up, my mom used to make "jelly rolls" ( i find the name really weird..hence why I keep saying sponge cakes ;-)). These were probably the only desserts that I didn't like growing up. They just seemed too...old? But I digress, seeing these gorgeously delicious sponge cakes inspired me to try my hand at creating some. And instantly I thought: chocolate sponge cake with cherry and chocolate mousse filling!!!!!! And then my next thought was: I need to slow down on the chocolate! So then my next though after that was (are you sensing a trend here? ): Vanilla! With Orange Zest! And Figssssssss!!!! So off I went to bake up a Vanilla Sponge Cake with Fig Jam and Orange Zest. For the actual cake itself I used this recipe. -Preheat oven to 350 degrees. -Spray a cookie sheet (15x10x1 in. pan) with cooking spray. 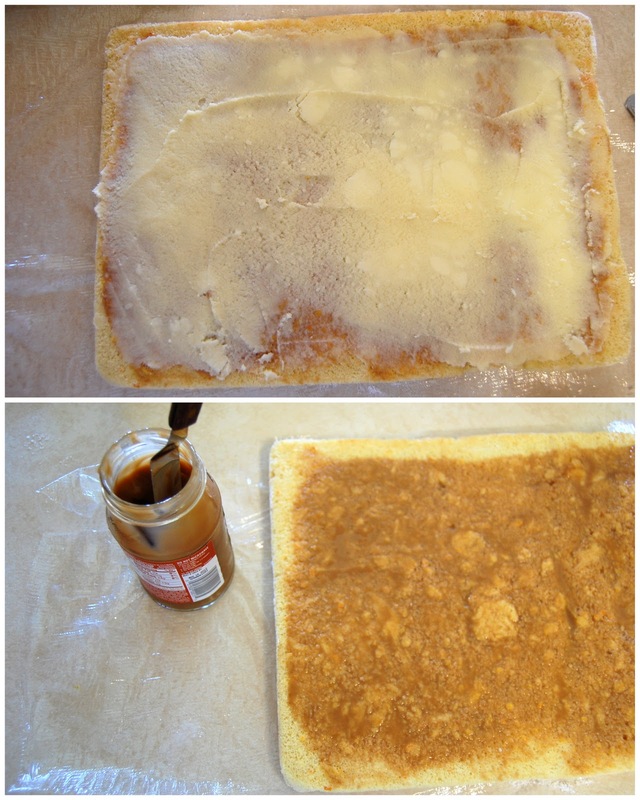 Then layer with a piece of wax paper, and spray again with cooking spray. Set aside. -Beat egg yolks and sugar until they are thick and have a lemony color. Mix in the orange peel, lemon juice, and vanilla. Then add sifted flour and salt. Don't worry, the mixture will be thick. 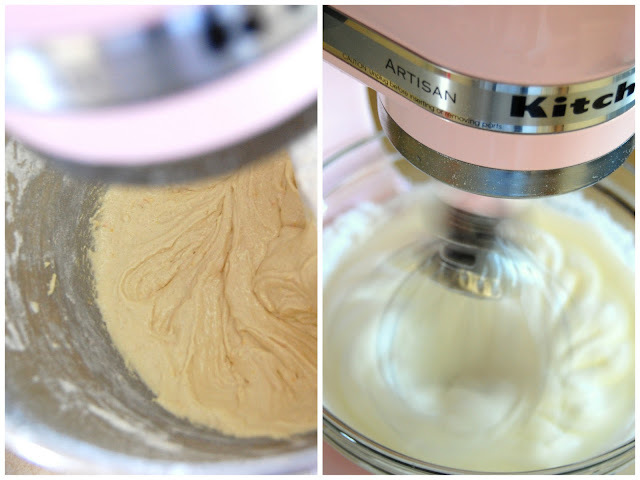 -Gently fold the egg whites into your batter. Then spread mixture into your cookie sheet. Tap once or twice to release any air bubbles. -Bake for 12-15 minutes or until a golden brown color. The cake is ready when it springs back when lightly touched in the center. -Cool in the pan for 5 minutes. Have a kitchen towel laid flat on your counter. Sprinkle the towel lightly with powdered sugar. Invert cake onto towel, and carefully remove wax paper. -Taking the extra edges of your kitchen towel, fold it over onto the cake. Roll the cake and towel into itself. Allow to cool to room temperature (about 30 mins - 1 hr). -When the cake has cooled,unroll it. Cut a piece of plastic wrap that is a few inches bigger than your cake. Lay it flat on your kitchen counter, and place the cake on it. -Spoon out some caramel and evenly distribute it on the cake. How much you choose to add is completely up to you! Do the same thing with the Swiss Meringue Buttercream. Again, how much is your decision! -Roll cake back into "jelly roll" form, but this time without any kitchen towels or plastic wrap in the center. The plastic wrap is to cover the rolled cake and prevent it from drying out. Place cake in refrigerator for a few hours, or overnight. -When you're ready to serve your cake, cover it with the Swiss Meringue Butter Cream, drizzled caramel, and sprinkle some orange zest on top. p.s. i tried recreating this cake by taking a shortcut and using boxed cake mix. As soon as I unrolled it, the cake crumbled so my advice is to stick to a sponge cake recipe. This looks divine! I've never made a sponge cake but I'm a huge fan of orange/citrus flavours in baked goods so I may try to whip up a vegan version. it's so pretty! and looks delicious. good job! Great work! I wish I had the drive to bake right now... It's just so dang hot outside. 98 degrees today!! this looks so good! yum!!! and your photos are great too! Oh. My. Goodness. This looks SO delicious! I wish I had cooking and baking talents. Nuha this seriously rocks! I love the flavor combination. Would you believe I've never made a proper sponge cake? I love your tip about using lemon juice as a natural cleaner for the KitchenAid bowl. That's pure genius.